A small clumping perennial, Orthrosanthus multiflorus with its attractive blue flowers is commonly called the Morning Flag. Although the flowers ar small, they are bright and rise well above the foliage. Grass like evergreen foliage and flowers held on tall stems above, it flowers from spring to summer. 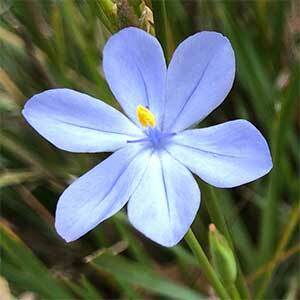 This is a plant that will flower in part shade, which makes a very useful plant fr the native garden. A position in part shade is best in most climates. Dig the soil over well before planting, removing weeds and adding some compost. The only regular maintenance required is the removal of spent flower heads to tidy up the look of the plant. Spread – To around .5 metre.